In its early days the 5-string banjo was associated with the south and bluegrass music. It was an instrument used primarily for rhythm and comedy. Yet, as decades passed some of the most influential and innovative banjo players came from the Tri-state region including musician and social activist Pete Seeger. The New York Banjo Summit brought together some of the biggest 5-stringers around. The banjo is a mainstay in bluegrass but has also found its way into folk, rock and even jazz and world music. In celebration of the instrument and its diversity seven of the world's most prominent banjo players united for a limited 10-city concert tour on the east coast. One of the lucky ten venues was the Count Basie Theater in Red Bank, New Jersey which hosted the event on October 27, 2012. Another game changer for banjo music was Earl Eugene Scruggs (January 6, 1924 - March 28, 2012). 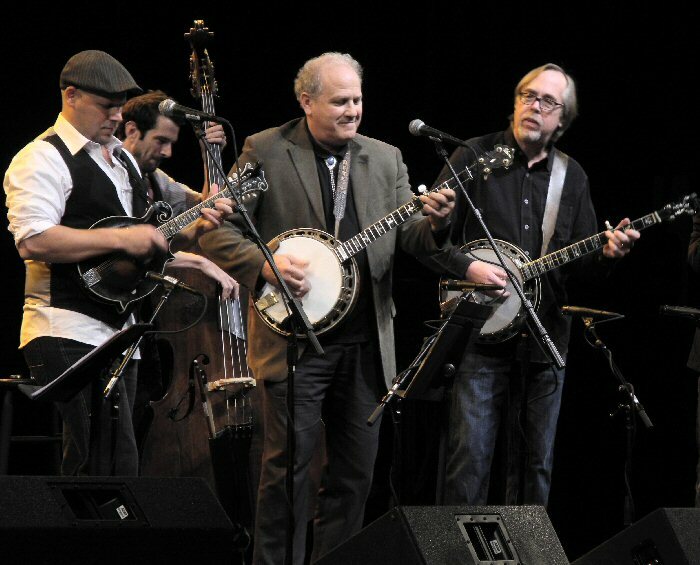 Born in North Carolina, Earl was known for perfecting and popularizing a three-finger banjo-picking style - now named "Scruggs style", which has become a defining characteristic of bluegrass music. 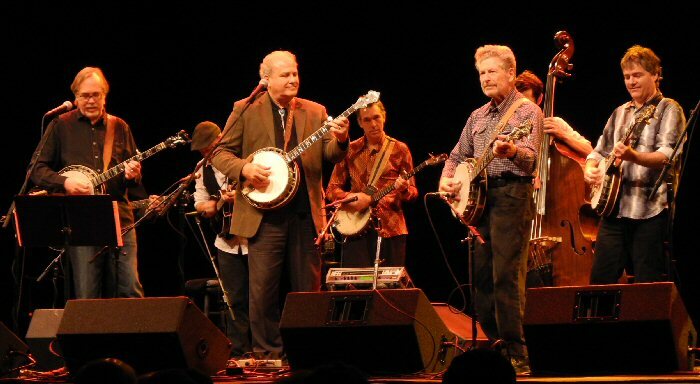 Both Scruggs and Seeger were mentioned often during The Banjo Summit on Saturday night. 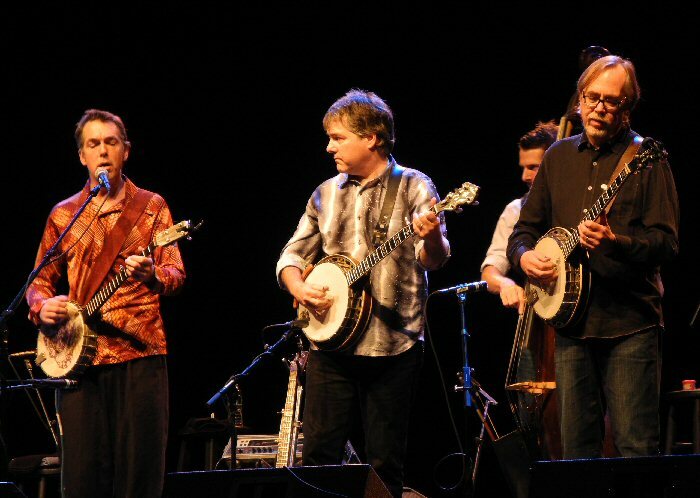 The Banjo Summit featured Grammy winner Bela Fleck (New Grass Revival & Bela Fleck and the Flecktones) and New Jersey resident Tony Trischka - a regular on A Prairie Home Companion. Tony was also Bela Fleck's teacher. In addition, Trischka has produced comedian Steve Martin. Also on board was Bill Keith (Bill Monroe's Bluegrass Boys and the inventor of "Keith Tuning Pegs"), Eric Weissberg (scored a #2 hit record with "Dueling Banjos," the theme from the movie Deliverance), Richie Stearns (Donna the Buffalo & The Horse Flies), Noam Pikelny (Leftover Salmon & The Punch Brothers) and Pete Wernick (Hot Rize, Country Cooking and the first President of the International Bluegrass Music Association). 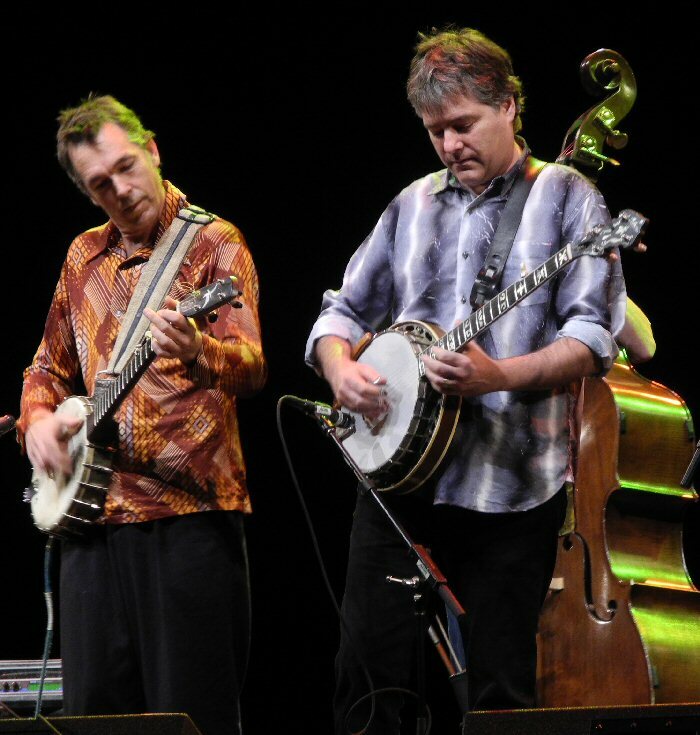 Richie Stearns, Bela Fleck and Tony Trischka at the Count Basie Theatre. The seven were supported by Russ Barenberg (guitar), Jesse Cobb (mandolin), Alex Hargreaves (violin) and Corey DiMario (bass). The Count Basie Theater with its ornate decor and superior sound system is a prime venue for any artist. The stage was stark with dark curtains, amps, mikes and stands. The band was visible first as each of the seven banjo players circled the stage as part of the introduction. Bela Fleck stopped by a mike to welcome the crowd to "our banjo geek fest". Pete Wernick - aka "Dr. Banjo" - originally from New York City started the show with a song that he had written about his parents. "Ruthie" was a sentimental love story that spanned a lifetime of love. Pete's pretty picking added to the sweetness of the song. The Doctor also talked about techniques such as the three finger roll patterns. After the lesson, Tony Trischka joined Pete Wernick on stage. The two delighted the crowd with a friendly banjo duel as the band provided a rolling rhythm. Next, Bill Keith from Woodstock, NY - who is widely considered a trail blazer of the melodic style of banjo picking - took center stage. During his set, Bill twisted keys on his instrument and commented that he liked the sound of changing strings. He also mentioned that by listening to fiddle players he figured out how to play those tunes on the banjo and he demonstrated an animated application of the concept. Noam Pikelny was introduced as the youngest member of the summit. Noam currently lives in Brooklyn, New York and has played in Leftover Salmon, the John Cowan Band and the Punch Brothers. Richie Stearns and Bela Fleck provided the most electrifying jam of the evening. "This is pretty special for all of us," stated Pikelny who performed a number of songs that he wrote. His tunes featured slow steady plunks that were punctuated by the band. Noam's set showcased solos from all the players emphasizing musicianship and a love and respect of traditions and the evolving styles of playing. Eric Weissberg was next. Eric was born and raised in NYC and he helped to bring the sound of the bluegrass banjo to mainstream America with his performance of "Dueling Banjos" on the soundtrack of the major motion picture "Deliverance". Eric has enjoyed a long career as a versatile studio musician. Weissberg played a peppy progression and sang as the band propelled the pace of the tasteful tune. Pete and Bill joined Eric for an engaging exchange. The next duel was with acoustic guitar player Russ Barenberg. The two skillfully battled - trading runs and lines from the theme song from "Deliverance". One by one the other six banjo players joined the mix for a spirited set of strumming before taking a short break. The second half of the summit which was about three hours in total began with Bela Fleck introducing his former teacher Tony Trischka. Tony originally from Syracuse, NY is credited with taking the bluegrass banjo to a whole new level in the 1970s with a series of recordings that explored rock and avant-garde jazz. Tony mentioned that he was working on a new record - yet to be named and played some songs that were also waiting for titles. Tony's tracks were multi-layered with Trischka providing both the leads and rhythms. His songs were catchy with lots of notes and nuances. Tony commended the band for having to learn all the thousand of chords that were being played throughout the summit. Richie Stearns of Ithaca followed Trischka. 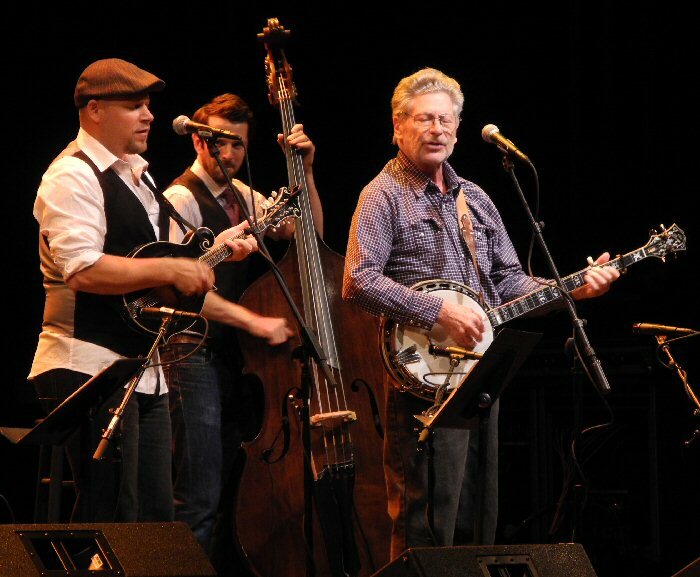 Richie is known for bringing the old-time claw-hammer banjo style to a whole new audience by performing with jam bands such as Donna The Buffalo and The Horseflies. Richie talked a little bit about his type of playing saying it is more like party music something that would be played at a square dance. His magical spin of mountain music included many innovative textures and tones. Eric Weissberg is most famous as the co-writer of the "Deliverance" theme song. Stearns mentioned that he is inspired by many sources and shared that for a short time he lived with people from Northern India and was galvanized to craft "Last Train to Rajastan". Richie and the band amazingly took blue grass instruments and crafted middle eastern sounds. At times, Stearns was sort of thumb thumping the strings of the banjo to give it a twang of India. Alex Hargreaves on violin played expansive notes that also added to the world tone of the piece. Host of the summit, Bela Fleck took a seat center stage. He is a native of Manhattan and began making waves with a series of progressive banjo-centric recordings in the 1970s and has continued to intrigue audiences with his unique banjo blends. Fleck alone with his banjo played a series of compositions that showcased a wide range of speeds and styles with a bit of humor included for good measure. Bela relayed that he had gone to Africa in 2005 and the next segment of music that he performed reflected those world tones as he gently tapped the base of his banjo for rhythm. Tony and Noam joined Bela and the trio each played separate parts of a song before performing it in unison. The exchanges were engaging and showcased fast finger picking. The other six banjo players and the band joined in for the grand finale. They played a series of feisty progressions with some of the players taking a turn in the lead role. For the encore, Bela Fleck came out stating that he liked to "play this one alone". As he was strumming, Tony sneaked up behind him and started playing notes on the neck of Bela's banjo. Next Trischka assisted with the picking and finally four hands performed the tune - a totally cool trick by the former teacher and his student. The band joined in and they jammed on an intriguing song with a pace that gave the allusion of movement as more players joined in and added various effects and picking to the mix thus ending the event on many grand notes! The Count Basie Theater is located in the heart of Red Bank, New Jersey. The downtown has cafes and stores. Since we had time before the show we went to the legendary Jack's Music Shoppe. Back in the days when record releases were more of an event Jack's had hosted many but it is still a good source for music in various new and used formats. We had dinner at the casual Surf Taco. Within a few moments of placing our order at the counter a generous, tasty dinner was delivered. Our last stop before the concert was the Cupcake Magician to pick up decadent chocolate chunk cupcakes for dessert, which we enjoyed later that night. In addition to being in an interesting town, the Count Basie Theater has an outdoor patio and bar area to be enjoyed before and after shows. The space was surrounded by plants and to our surprise there were some roses still in bloom. Pete Wernick - aka "Dr. Banjo" - took center stage as the evening's first emcee.